This document provides concepts and procedures for deploying a Red Hat Enterprise Linux 8.0 Beta virtual machine (VM) on several major public cloud platforms. If you have created VMs for public clouds using other Linux distributions, or if you are only looking for required packages and drivers, review the individual topics provided to find what you need. The following topics provide step-by-step guidance for deploying a Red Hat Enterprise Linux 8.0 Beta virtual machine (VM) on Microsoft Azure. You need a Microsoft Azure account and a Red Hat Customer Portal account to successfully complete the steps. Enroll in Red Hat Cloud Access. Red Hat Cloud Access allows you to move your Red Hat subscriptions from physical or on-premise systems onto Microsoft Azure with full support from Red Hat. In addition to the manual steps provided in the following sections, there are other ways to get a Microsoft Azure VM image. These methods are listed below. Note that while these methods may be quicker, it may be useful to complete the manual steps and learn about the required packages and configuration changes necessary for Red Hat Enterprise Linux VMs operating in Microsoft Azure. Composer provides a pre-built image for creating a VM for Microsoft Azure. See Preparing Composer for Creating Azure VHD Images. Many Red Hat Enterprise Linux images are available from the Microsoft Azure Marketplace. Note that there are VM usage cost differences between using your Red Hat subscriptions through the Red Hat Cloud Access program (called Bring Your Own License, or BYOL, in Microsoft Azure) and using a Pay-As-You-Go marketplace image from Microsoft. See Billing options in the Azure Marketplace for more information. To configure a public cloud VM (or instance), you start with a base (starter) VM image. Once the base VM image is created, you modify configuration settings and add the packages required for the VM (or instance) to operate on the public cloud platform. Further configuration changes may be made after the image is uploaded and operating. This is typically required when the VM is used for a specific application. The recommended base VM image to use for all public cloud platforms is the Red Hat Enterprise Linux 8.0 Beta KVM Guest Image downloaded from the Red Hat Customer Portal. The KVM Guest Image is pre-configured with the following cloud configuration settings. The root account is disabled. For several public cloud platforms, you temporarily enable root account access to make configuration changes and install packages required for the public cloud. The instructions for temporarily enabling root account access are provided in this guide. A user account named cloud-user is pre-configured on the image. The cloud-user account has sudo access. The image has cloud-init installed and enabled. cloud-init is a service that handles provisioning of the VM (or instance) at initial boot. You can choose to use a custom Red Hat Enterprise Linux ISO image. However, note that when using a custom ISO image, additional configuration tasks may be necessary for the resulting VM to operate on the public cloud platform. The procedure assumes you are creating a VM image for Azure using Red Hat Enterprise Linux or Fedora. To successfully complete the procedure, you need to have the packages listed in the following table installed. Note that these packages are located in the base fedora repository (if using Fedora). Microsoft Azure VMs must have the following configuration settings. Some of these settings are enabled during the initial VM creation. Other settings are set when provisioning the VM image for Microsoft Azure. Keep these settings in mind as you move through the procedure and refer back to them if you need to. ssh must be enabled to provide remote access to your Azure VMs. The primary virtual adapter should be configured for dhcp (IPv4 only). Do not create a dedicated swap file or swap partition. Swap space may be configured in the Windows Azure Linux Agent. Choose virtio for the primary virtual network adapter. Users may use Azure Disk Encryption (ADE) for on-demand (Pay-As-You-Go) operating system disks on Red Hat Enterprise Linux (RHEL) 7.2 or later versions in Microsoft Azure. Data disks may be encrypted for any supported version of RHEL on Azure. ADE uses a new encryption method in RHEL 7.6, but the extension for enabling ADE on RHEL 7.6 is not available at this time. If you need to use ADE on RHEL 7.6, choose an earlier version of RHEL, encrypt the virtual machine (VM), then upgrade to RHEL 7.6. This VM will continue to use the pre-RHEL 7.6 encryption method. OS disk encryption is not supported for RHEL VMs in Microsoft Azure when using Red Hat Cloud Access VMs, RHEL 6 or any version of RHEL where the Red Hat shipped packages were modified. Red Hat and the open source community continually optimize the KVM Guest image for virtualized environments. Once you have the image configured, you can use this image as a template for creating additional VMs in Microsoft Azure. Download the latest Red Hat Enterprise Linux 8.0 Beta KVM Guest image from the Red Hat Customer Portal. Create and start a basic Red Hat Enterprise Linux VM. See 2.2. Creating virtual machines for instructions. When creating the VM, use the following configuration settings. Change the default memory and CPUs to the capacity settings you want for the VM. Select virtio for the virtual network interface. Shut down the new VM after a login prompt appears. Set up root access to the VM. From your system, use virt-customize to generate a root password for the VM. # virt-customize -a /var/lib/libvirt/images/rhel-guest-image-8.0-120.x86_64.qcow2 --root-password password:redhat! Verfiy root access by starting the RHEL VM and logging in as root. Once you are logged in as root, go to Configuring the base image for Microsoft Azure. The following procedure lists the steps and initial configuration requirements for creating a custom ISO image for Microsoft Azure. Download the latest Red Hat Enterprise Linux 8.0 Beta Binary DVD ISO image from the Red Hat Customer Portal. Choose the memory and CPUs you want to use for the VM. Make the following additional installation selection and modifications. For Installation Destination, select Custom Storage Configuration. Use the following configuration information to make your selections. Remove swap space. Swap space is configured on the physical blade server in Azure by the WALinuxAgent. This step is completed later in the configuration section. Verify at least 500 MB for /boot. The remaining space may be used for root /. Logical Volume Management (LVM) may be used but Standard Partitions are preferred. See Logical Volume Management (LVM) Support in Microsoft Azure. File System: xfs, ext4, or ext3 may be used. Set a generic host name and verify that ens3 is enabled. When installation is complete, reboot the VM and log in to the root account. The base image requires configuration changes to serve as your gold Red Hat Enterprise Linux 8.0 Beta VM image in Microsoft Azure. The following sections provide the additional configuration changes required. Microsoft provides network and storage device drivers as part of their Linux Integration Services for Hyper-V package. Hyper-V device drivers may need to be installed on the VM image prior to provisioning it as a Microsoft Azure VM. Use the lsinitrd | grep hv command to verify that the drivers are installed. Enter the following grep command to determine if all of the required Hyper-V device drivers are installed. In the example below, all the drivers are installed. One or more drivers may already exist in the environment. All drivers must be present. Complete the remaining steps if all drivers are not listed as shown in the example. Create a file named dracut.conf in /etc/dracut.conf.d. Add the following driver parameters to the dracut.conf file. Note the spaces before and after the quotes, for example, add_drivers+=" hv_vmbus ". This ensures that unique drivers are loaded in the event that other Hyper-V drivers already exist in the environment. Verify that the drivers are installed by running the lsinitrd | grep hv command. The VM requires further configuration changes to operate in Microsoft Azure. Complete the following steps to make these changes. If necessary, power on the VM. Stop the cloud-init service (if present). Edit the /etc/ssh/sshd_config file and enable password authentication. Set a generic host name. Edit (or create) the /etc/sysconfig/network-scripts/ifcfg-eth0 file. Use only the parameters listed below. The ifcfg-eth0 file does not exist on the RHEL 8 DVD ISO image and needs to be created. Remove all persistent network device rules (if present). Set ssh to start automatically. Modify the kernel boot parameters. Add crashkernel=256 to the start of the GRUB_CMDLINE_LINUX line in /etc/default/grub file. If crashkernel=auto is present, change it to crashkernel=256M. Add the following lines to the end of the GRUB_CMDLINE_LINUX line (if not present). Remove the following options, if they are present. Register the VM and enable the Red Hat Enterprise Linux 8.0 Beta repository. Install and enable the Windows Azure Linux Agent (WALinuxAgent). The WALinuxAgent is included in Red Hat Enterprise Linux 8.0 Beta Application Stream (AppStream). See Using Application Stream for more information. Edit the following lines in the /etc/waagent.conf file to configure swap space for provisioned VMs. Set swap space for whatever is appropriate for your provisioned VMs. Unregister the VM from Red Hat Subscription Manager. Prepare the VM for Microsoft Azure provisioning by cleaning up the existing provisioning details. Azure reprovisions the VM in Azure. This command generates warnings, which is expected. Clean the shell history and shut down the VM. All Azure VM images must be in a fixed VHD format. The image must be aligned on a 1 MB boundary before it is converted to VHD. This section describes how to convert the image from qcow2 to a fixed VHD format and align the image if necessary. Once you have converted the image, it can be uploaded to Microsoft Azure. Convert the image from qcow2 to raw format. Create a shell script using the contents below. echo "Your image is already aligned. You do not need to resize." Run the script. The name align.sh is used in the example. If the message "Your image is already aligned. You do not need to resize." is displayed, proceed to the following step. If a value is displayed, your image is not aligned. Go to Aligning the image and convert it to a fixed VHD format. Use the value displayed to resize the image. Use the command below to convert the file to a fixed VHD format. The additional option force_size must be added when using Fedora 22 or later. Once converted, the VHD file is ready for uploading to Microsoft Azure. Complete the steps below only if the raw file is not aligned. Resize the raw file using the rounded value displayed when you ran the verification script. Convert the raw image file to a VHD format. Complete the following steps to install the Azure command-line interface (Azure CLI 2.0). Azure CLI 2.0 is a Python-based utility that is used to create and manage VMs in Microsoft Azure. You need to have an account with Microsoft Azure before you can use Azure CLI. The Azure CLI installation requires Python 2.7.x or Python 3.x and OpenSSL 1.0.2. Complete the procedures in the following sections to upload the vhd file, create a gold Azure custom image, and start a RHEL VM in Microsoft Azure. Enter the following command to authenticate your system with Microsoft Azure and log in. To sign in, use a web browser to open the page https://aka.ms/devicelogin and enter the code FDMSCMETZ to authenticate. Create a storage account. See SKU Types for more information about valid SKU values. Export the connection string. Copy the connection string and paste it into the following command. This string connects your system to the storage account. Complete the following steps to upload the VHD file to your container and create a gold Azure custom image. The exported storage connection string does not persist after a system reboot. If any of commands in the following steps fail, export the connection string again. See Step 5 in Creating resources in Microsoft Azure. Upload the vhd file to the storage container. It may take several minutes. To get a list of storage containers, enter az storage container list. Get the URL for the uploaded vhd file. You will use this URL in the following step. [clouduser@localhost]$ az storage blob url -c azrhelclistcont -n rhel-image-8.vhd "https://azrhelclistact.blob.core.windows.net/azrhelclistcont/rhel-image-8.vhd"
Create the gold Azure custom image. The command may return the error "Only blobs formatted as VHDs can be imported." This error may mean that the image was not aligned to the nearest 1 MB boundary before it was converted to VHD. See Converting the image to fixed VHD format for more information. The following steps provide the minimum command options to create a managed-disk Azure VM from the image. See az vm create for additional options. Enter the following command to create the VM. The option --generate-ssh-keys creates a private/public key pair. Private and public key files are created in ~/.ssh on your system. The public key is added to the authorized_keys file on the VM for the user specified by the --admin-username option. See Other authentication methods for additional information. Note the publicIpAddress. You need this to log in to the VM in the following step. Start an SSH session and log in to the VM. [clouduser@localhost]$ ssh  -i /home/clouduser/.ssh/id_rsa clouduser@<public-IP-address>. The authenticity of host ',<public-IP-address>' can't be established. Warning: Permanently added '<public-IP-address>' (ECDSA) to the list of known hosts. If you see a user prompt, you have successfully deployed your Azure VM. You can now go to the Microsoft Azure portal and check the audit logs and properties of your resources. You can manage your VMs directly in the Microsoft Azure portal. If you are managing multiple VMs, you should use the Azure CLI. The Azure CLI provides a powerful interface to your resources in Azure. Enter az --help in the CLI or see the Azure CLI Command Reference to learn more about the commands you use to manage your VMs in Microsoft Azure. While recommended for increased security, the use of the Azure-generated key pair is not a requirement. The following examples show two other methods for SSH authentication. Example 1: These command options provision a new VM without generating a public key file. They allow SSH authentication using a password. Example 2: These command options provision a new Azure VM and allow SSH authentication using an existing public key file. The following topics provide step-by-step guidance for deploying a Red Hat Enterprise Linux 8.0 Beta EC2 instance on Amazon Web Services (AWS). Enroll in Red Hat Cloud Access. Red Hat Cloud Access allows you to move your Red Hat subscriptions from physical or on-premise systems onto AWS with full support from Red Hat. Important: You need to sign up for AWS and set up your AWS resources first. See Setting Up with Amazon EC2. There are several ways to get a Red Hat Enterprise Linux 8.0 Beta image from Red Hat to use on AWS. Once you enroll in the Red Hat Cloud Access program with eligible Red Hat subscriptions, you can access a library of Red Hat gold images shared with you on AWS. See Getting a Red Hat Cloud Access gold image for instructions. Composer provides a pre-built image for creating an EC2 instance for AWS. See Preparing Composer for Creating AWS AMI Images. The AWS Marketplace provides many Red Hat Enterprise Linux images. See the AWS Marketplace for additional information about available Red Hat images. Complete the following steps to list Red Hat Cloud Access gold AWS images. Enroll in the Red Hat Cloud Access program. Once you are enrolled and have available subscriptions, you are able to access Red Hat gold images. 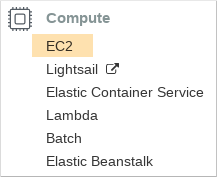 Select EC2 in the Compute category under services. Click Launch Instance and select My AMIs. Check the Shared with Me box. The Red Hat gold images made available through Red Hat Cloud Access are listed. Complete the following steps to create an EC2 instance using the AWS console. The following procedure provides general instructions for creating a basic Red Hat Enterprise Linux instance. The steps are based on Launching an Instance Using the Launch Instance Wizard. Refer to the AWS procedure for details and updates. Set up your AWS resources before completing the procedure. See Setting Up with Amazon EC2 for details. You should not start the procedure if resources have not been created. 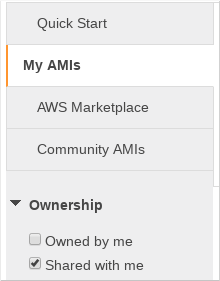 Launch the AWS Management Console. Choose an Amazon Machine Image (AMI). Note that the Red Hat Cloud Access program provides a library of shared Red Hat gold images. See Listing Red Hat Cloud Access gold images for instructions. Choose an Instance Type that meets your capacity requirements. The recommended capacity for a base Red Hat Enterprise Linux instance is General purpose, t2.medium. See Amazon EC2 Pricing for additional details. Enter the Number of instances you want to create. For Network, select the VPC you created when setting up your AWS environment. Select a subnet for the instance or create a new subnet. Select Enable for Auto-assign Public IP. The selections above are the minimum configuration options necessary to create a basic instance. You may want to review additional options based on your application requirements. Click Next: Add Storage. Verify that the default storage is sufficient. Click Next: Add Tags. Add a label for the instance(s). This can be anything that is simple and easy to identify later. Make sure to adhere to AWS tagging guidelines. Click Next: Configure Security Group. Select the security group you created when setting up your AWS environment. Click Review and Launch. Verify your selections. Click Launch. You are prompted to select an existing key pair or create a new key pair. Select the key pair you created when setting up your AWS environment. Verify that the permissions for your private key are correct. Use the command options chmod 400 <keyname>.pem to change the permissions if necessary. Click View Instances. You can name the instance(s) here. You may want to use the RHEL host name. You can now launch an SSH session to your instance(s) by selecting an instance and clicking Connect. Use the example provided for A standalone SSH client.